Milk Oolong is also known as Jin Xuan, Golden Lily, Nai Xiang. …we call it Milk Oolong, the delightful Taiwanese tea sourced from the Jin Xuan cultivar. Its lightly roasted, green-and-olive leaves produce a lovely golden yellow liquor, giving your cuppa an appearance to match its enchanting aroma and silky smooth flavor. But what’s with the ‘milk’? I’m allergic to all dairy products! Don’t panic. The ‘milk’ in this case doesn’t refer to any milk additives. The milky or creamy flavor of this tea comes straight from its source – fresh Jin Xuan leaves, responding to the cool evenings and sun-kissed mornings of the Taiwanese hills where they’re grown. Upon light roasting, the natural ‘milky’ tones of the leaves are further enhanced to result in the familiar, and highly sought-after, Milk Oolong aroma and taste. Cheaper variants of Milk Oolong are often assembled using low-quality tea leaves and artificial milk flavoring. Imitation oolongs usually aim for a pronounced milk flavor, ending up as overkill at best. In fact, certain Milk Oolong manufacturers can go so far as to claim that they’ve given the tea leaves a soak or a steam in milk! This isn’t even close to the subtle, buttery tones naturally created by the lactones in the Jin Xuan leaves, giving real Milk Oolong a flavor that must be experienced to be understood. The pure, natural milky aroma and flavor of the Taiwan oolong is unmatched in its ability to draw you in. Subtle, often elusive, and varying from tea batch to tea batch, it has all the makings of a natural property that cannot be artificially synthesized. The beautifully balanced combination of orchid-like scents and buttery textures doesn’t fail to impress even high caffeine morning tea enthusiasts who usually prefer full bodied brews with strong flavors. Because when it’s comfort and relaxation that you’re after, there’s no better place to find it than in a freshly steeped cup of light, flowery, buttery, naturally sweet Milk Oolong! 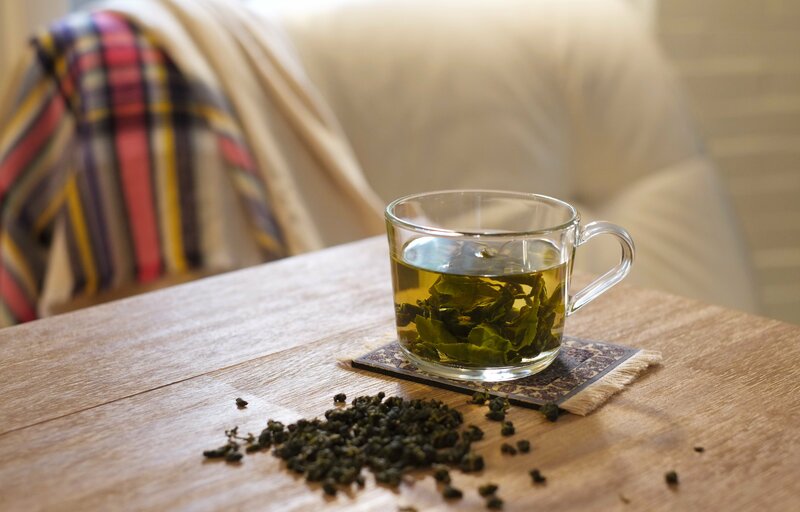 There is a cultivar that comes from Taiwan that does produce many of the milk oolongs that you can purchase in the US – however ours is by far superior and comes from the Wuyi region of China which is also famed for Oolong products. Oolongs are produced in several places – just like wine – and there are differences in taste profile based on growing climate and cultivation. Jin Xuan is just one variety of many Oolongs. However, it does stand alone due to its unique and unconventional flavor. Once you try it, you will never forget. The one particular tea I sampled, and can honestly recommend, happen to be Jin Xuan Milk Oolong by Tealyra, purchased from Amazon. Delivery was swift, the smell of the dry tea leaves was astonishing and the infusion was pale golden. The tea leaves were probably about 30% oxidized, closer to green tea than the black one. Although that famous milky flavor is often described as “elusive”, it was quite pronounced in my cup. It doesn’t dominate the taste of the tea though. The whole tasting spectrum varies from peachy, floral, and slightly grassy notes to savory umami flavor. In fact, there was quite a lot of umami in this tea. After steeping and sipping and steeping again for the best part of my day, I realized why oolongs are often recommended for weight loss and detox. In my case, I missed my lunch without noticing it. It was almost like sipping very light and fragrant chicken broth. As with any oolongs, this one retains its flavor through multiple infusions and I would say that my third and fourth ones were the best of all and absolutely superlative. The tea isn’t exactly cheap, but consider that just a few leaves will go a long way and can be “reused” for 4 to 6 infusions, if not more. Do not expect any Teavana-style drama, full of crazy, incompatible flavors. This is a very mellow, delicate, dignified tea with its own quiet and charming personality that wouldn’t fail to impress you once you get to know it closer.